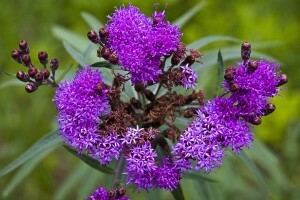 Prairie ironweed (Vernonia fasciculata) is common in Minnesota in the lower two-thirds of the state and in the northwestern border counties. Its showy, reddish-purple flower heads appear from July to September on wet and moderately moist prairies. It is pollinated mostly by butterflies, skippers, and long-tongued bees. 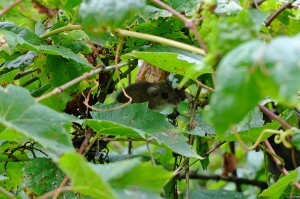 This species is identified by the hairless leaf undersurface that is dotted with pitted glands. When held up to the sun or other light the glands appear as translucent dots. There are two subspecies of prairie ironwood, both of which are found in Minnesota. The eastern subspecies, ssp. fasciculata, is identified by the longer stem; longer, narrower leaves; and upper leaf surface that is smooth to the touch. 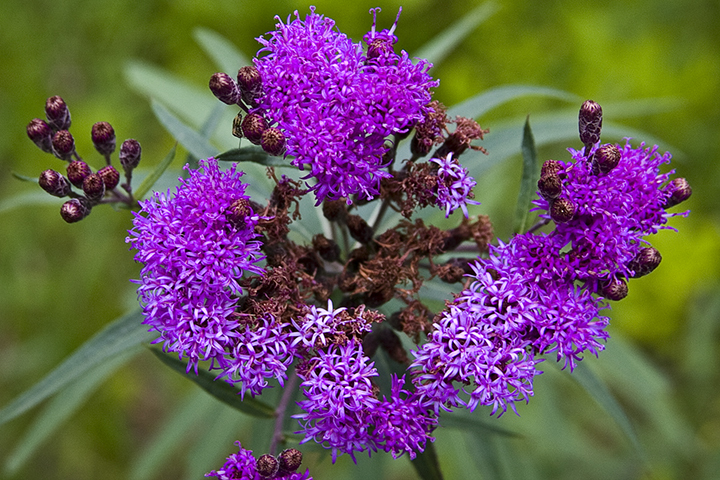 This entry was posted in Plants and tagged prairie ironweed, Vernonia fasciculata ssp. fasciculata on March 25, 2015 by John Valo. Pearly everlasting (Anaphalis margaritacea) is common in the northeast, central, and Twin Cities metro areas of the state. It can be found in woodland edges and openings, roadsides, and disturbed sites. 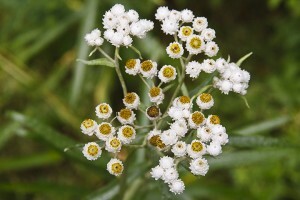 From July to September it produces showy clusters of bright white and yellow flower heads. Male and female flowers are borne on separate plants. Female flower heads usually have a few male flowers, however the plants are not self-fertile. Separate male and female plants must be present to produce seed. This species is identified by the stalkless leaves that continue down the stem at the base, the broad flower heads, the presence of only male flower heads or female flower heads on an individual plant, and the presence (usually) of a few male flowers on the female flower heads. This entry was posted in Plants and tagged Anaphalis margaritacea, pearly everlasting on March 23, 2015 by John Valo. This entry was posted in Mammals and tagged Peromyscus maniculatus bairdii, Prairie deer mouse on March 18, 2015 by John Valo. 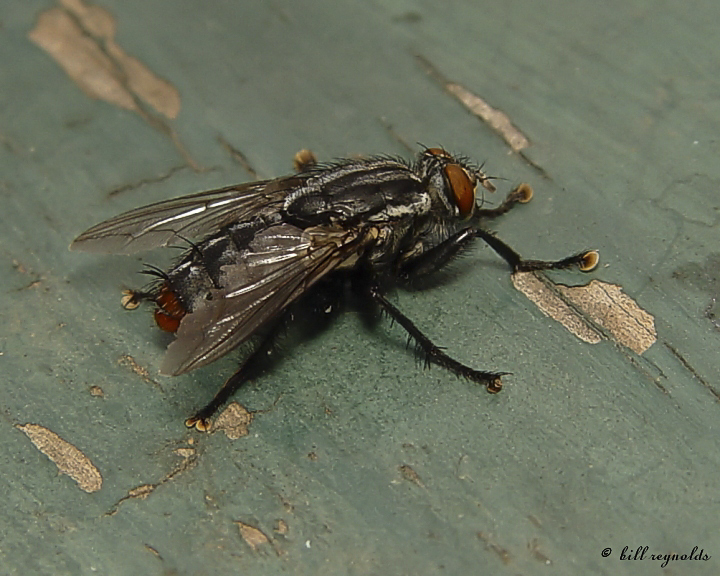 There are 3 subfamilies, 108 genera, and about 2,500 species of flesh flies (Sarcophagidae). These flies deposit already hatched larvae on carrion, dung, or animal wounds. The red-tailed flesh fly (Sarcophaga haemorrhoidalis) is often the first or one of the first insects to visit a corpse. This makes them useful in determining the amount of time that has elapsed since a person has died. This species is identified by three gray stripes on the thorax; gray and black checkerboard pattern on the abdomen; reddish-brown external genitalia at the tip of the abdomen of the male; 4 bristles on the notopleuron (a region on the thorax); a long bristle on the upper side of the antenna that is feathery at the base; well developed lobes at the base of the wing; and an R5 wing cell that is closed or narrowed at the end. This entry was posted in Insects and tagged red-tailed flesh fly, Sarcophaga haemorrhoidalis on March 1, 2015 by John Valo.